You’ve got a ton of Followers but are they Listening? Over the last few months Twitter (or the technology of micro-blogging) has marched its way to penetrate the mainstream and just like any new web technology that does this, we see a much wider base of users and then come the spammers. Even prior to this phenomenon there was a race to gain followers. Many felt that having a large number of followers would equate to being considered an “authority” and that messaging sent by these users would carry more weight. While in some cases that could be true, I feel that this is now more the exception than the rule. This behavior seems to also have spread to other services such as FriendFeed and Facebook causing a huge followfest along with the blaring volume of messages that accompany being at a huge party. I’m not saying this is a bad thing, but with this new behavior comes the need to find a way to manage how to still effectively listen to the people that matter to you. 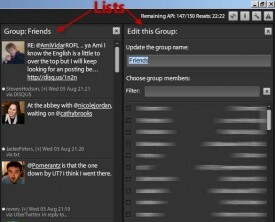 Luckily there are quite a few tools that allow us to do this fairly effectively by creating lists of people that we can filter by. 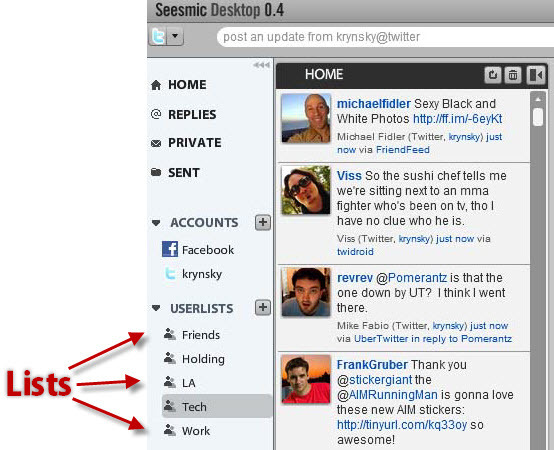 For Twitter we luckily have the two most popular tools both supporting lists in Tweetdeck and Seesmic. below I have screenshots of where those lists reside in each of the programs. 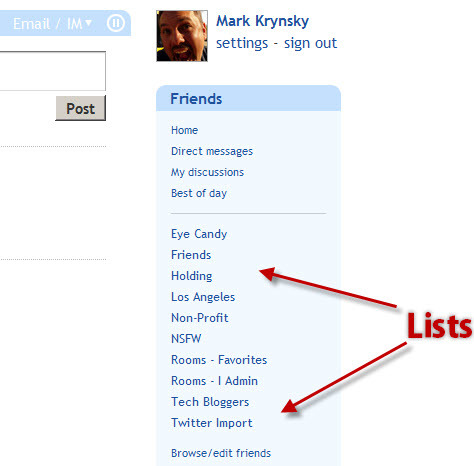 This post isn’t to show you how to setup lists in each of these tools but I will provide links to help you at the end of the post. So why am I showing you all of this? Because having a humongous follower count brings with it a tidal wave of data. It is becoming pretty clear that being followed alone isn’t enough anymore. If you want to be heard I think it’s going to become increasingly important to make it onto people’s lists. A few months back I read a great post by Mike Fruchter titled My State of Social Media. In it Mike talks about the race to gain followers and states that “Lists are now the tool of choice for fake following”. While I disagree and feel that list management can be used in a way to follow a larger audience, it does glean perspective on whether or not people who follow you nowadays are listening. Many folks cite the Dunbar number which states that you can really only effectively follow about 150 people. Others have chosen different approaches and just decided to clean house which is what Robert Scoble recently did by deleting all of his followers and starting from scratch again. Louis Gray found Robert’s tactic to be the wrong approach and provided insight as to why in his post to Jump on the massive unfollowing trend would be a mistake. 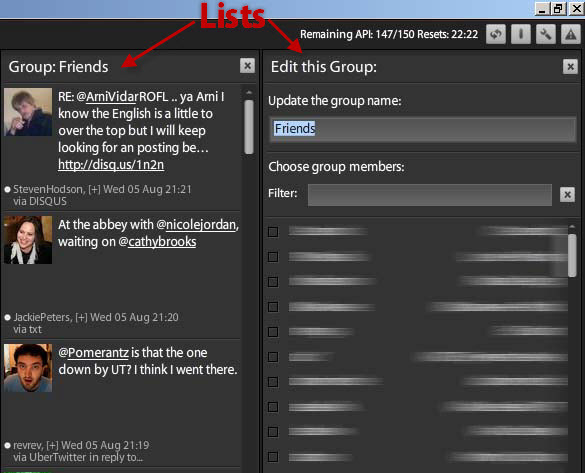 Louis has shown me how he manages users on FriendFeed and he is a list managment ninja. As you can tell by the way I’ve configured my tools and services I side more with Louis and also read about how Marshall Kirkpatrick manages people. Sure it takes quite a bit more work to have to create multiple lists and categorize people into them, but I feel it provides a much more effective way to be able to make sure you can listen to them. So how can you determine if or how well you are being heard? Well there are several good analytics tools that can help you figure that out. If you use a short URL service that offers the ability to see if people are actually clicking on the links you are sending out. 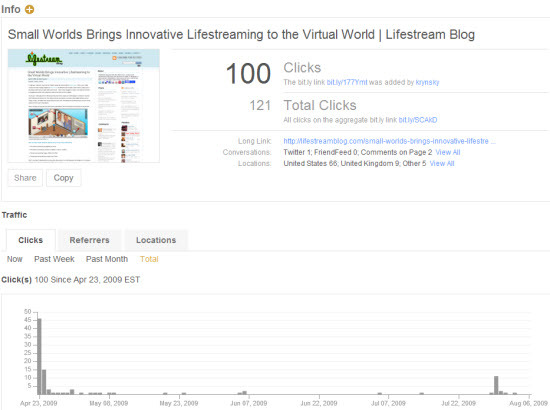 I’m a fan of bit.ly which not only tells you how many clicks you got, but where they came from and over what period of time. I can also find out if people are listening to me on various services when I send out notifications about new posts by looking at data in my web analytics program. 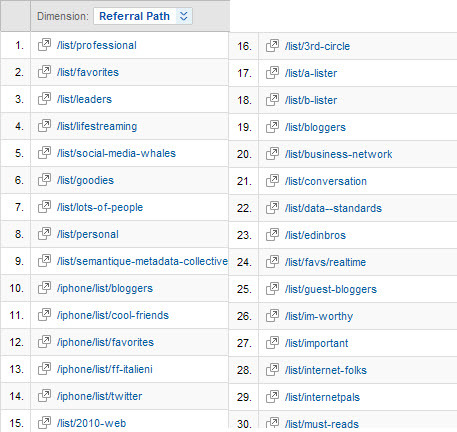 I use Google Analytics but any of them will provide the info by looking at the referrer data. Another fun thing that you can do with referrer data that I’ve only been able to glean from the traffic coming from FriendFeed is how people label you on their lists. Below is an image with a breakdown of 30 lists that people have placed me on where they clicked on my links to visit this blog. It has been interesting, enlightening and funny to see how some people have decided to classify me. This alone I believe provides pretty good evidence that I’m getting traffic specifically because people where able to find my links once they filtered my posts on their lists. There’s a good chance that otherwise, they may have never seen my posts come through their stream. I think that the behavior of creating lists to filter people will continue to become a tactic used by many and as this continues to happen it will become important to make your way onto them or just get lost in their main stream. I don't know that I would go as far as Marshall Kirkpatrick, never unfollowing or unsubscribing. I think both trimming bloated lists and organizing into groups are important. An automatic follow on anything is probably not the best. We want to hear from people that interest us and be heard by people we interest. That's going to take work and it probably won't result in massive numbers for most people. I agree. I don't currently autofollow and review every single subscriber manually and often put them into a list once subscribing. It takes more work but in the end I think I can get a much better signal to noise ratio. Good analysis and trend spotting in social media Mark. Yourself and Louis Gray inspired a video and blog post out of me (tomorrows). 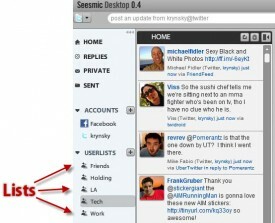 Tools that automate lists based on content will have great value to heavy social media users. I've gotta keep working on some concepts and rally more developers help. Your users listening is only part of the story. Are YOU listening to them to? Networking — and collecting followers on Twitter is neetworking — is not an aim in itself, but a means to an end. There needs to be a point why you're growing a list of contacts. And the strategy you have will determine what media you use, who you follow, who you court as followers, what you post to them, what you expect back, how you measure results and how you judge the effectiveness of your activity. For some, it might not matter that people are listening so long as they are learning. InverSearch is a commercial exchange for information, opportunities, products, resources and services. No searching. Connect with multiple businesses simultaneously with a single confidential message, increase efficiency and reduce information overload. No advertising. Businesses receive inquiries directly from consumers and other businesses without advertising, which results in lower costs and higher conversion rates. No irrelevant results. Inquiries and responses are user-generated content. For more information please visit the InverSearch About page at http://www.inversearch.com/Default.aspx?selecte… and the InverSearch Blog at http://inversearch.blogspot.com. Glad you liked it Mark. I'm looking forward to your post and video. Report back once it goes live. I couldn't agree more with your summation about Twitter followers and authority. Within the past 3 months I've found that I'm much more likely to to not follow someone with thousands of followers (and following thousands). Not that they aren't involved or that they are automatically a spammer but you simple can't have meaningful interaction with a community of that size. This post is a great rundown of the 3 major social networks and how to use lists to manage your information stream. Well down with good screenshots. Lastly, Thank you very much for linking to my Friendfeed Stream Article. I've never autofollowed and I'm so grateful that I've manually chosen to follow people throughout my history on Twitter. It still takes alot of work to prune my lists to maintain a good signal to noise ratio. So far I've found it necessary to have a formal or informal “Follow Policy” and a good follower management tool. I wrote about my Follow Policy and more here “Prevent your Twitter stream from becoming a flood http://bit.ly/AELBn“ and for follow management, Refollow (http://refollow.com) is by far the best I've found. I've followed you on Friendfeed for quite sometime but just subscribed to your RSS. Good stuff man. I read your post which was great. I agree with your points. Also, thank you for sharing refollow.com which I tried briefly and appears to be a really great tool. Thanks for the kind words and your article on list management as well as the other post in your previous comment. I like what I've seen already from your blog and am now a subscriber. so you'd rather have someone who has 1000000000000 followers and follows 111 back? For the most part, Yes. One really can't control the number of people that follow them but they can exert control over who they follow. Output is unregulated but input is moderated. If someone is only following a few hundred and participates in the community then I'll be more likely to assume they are actually having valuable conversations. Whereas if someone is following 40,000 then it is impossible to have “high signal” conversations. True Scoble ruffled some feathers but I think he did so in order to be able to listen to his followers. He opened several avenues for people to let him know they'd like to be refollowed. With the amount of spam and abuse that he was surely experiencing who can blame him for wanting wipe the slate clean. I couldn't agree with you more. I think it all has to do with targeted traffic. I mean If all or most of you followers are from other internet marketers using an automated system, then the likeliness of you having any profits/success with them is highly unlikely.